Struts - Bonnet & Boot. Holden Bailey Door Belt Weather Seal Strip FRONT Kit HJ HX HZ WB belt rubber. You are looking at a complete front door rubber kit to suit. Holden HJ HZ HX & WB. Sedans Wagons Utes Vans Statesman One Tonners. (will not fit 2 door coupe). 2 X NEW Front door seals. 2 X NEW Bailey channels. 2 X NEW Outer weather strip / door belt (front). 2 X NEW Inner weather strip / door belt (front). This is enough to do both front doors on your rocket. These are all brand new and will really help stop your doors rusting and the wind whistling in your ear. These parts suit the front doors of all HJ-WB sedan, wagon, Statesman, ute, van and one tonner, but not coupe! 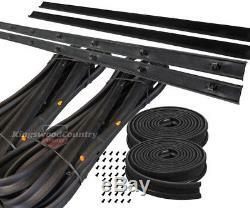 The Weather strip/belts are made from high quality rubber. These mount to the top of the door body and seal against the bottom of the door glass to help stop your door filling up with water. They commonly crack and get all hard and crappy! Our Door Seals are made with beautiful'soft closing' rubber and quality fitting clips and sockets. The'T' clips fit perfectly to the door where it pushes into the steel on the upper part of the door, and this seal comes complete with a set of lower door seal sockets for the lower part of the door. They also have 2 orange retainer clips to show where to begin when installing these (the two orange clips fit in to the two holes which are closer together, just above the door catch) - making fitting a breeze. Our soft closing seals have a high natural EPDM which is still \superior to any man-made substance - this is why some manufacturers of cheaper aftermarket seals leave it out. Our Bailey Channel will help stop the wind whistling in your ear and these high quality Baileys will make your windows go up and down real nice! It is made of high quality rubber and felt. Great finish and easy to fit. All Resto Country rubber products contain the as original component of EPDM. Seals with the correct balance of compounds also make it vastly easier to install on the car. We also have all these components separate and in kits and check out our store for. Inner & Outer door handles. Restoration kits with hundreds of hard to find clips, nuts and bolts. Thanks for looking and don't forget to check out all of our Restoration Essentials in our store. (formally Kingswood Country) was first established in 1986. Came about because in addition to specialising in new Restoration, Used and New (genuine / non-genuine) parts for your Holden Kingswood & Torana we are also now growing our range of parts for pre-Kingswood models plus Commodore and early Fords. We source and manufacture a range of restoration parts for your dream car rebuild. These are the best and closest we can find to original parts at affordable prices and we are proud to offer these under our own. We are a family owned and operated independent business located in Melbourne's Sth East suburb of Moorabbin. Thanks for looking at our store and hope to talk with you soon. Any questions please send us a message and we will get straight onto it for you. We're a shop/warehouse in Moorabbin. You are most welcome to drop in and browse or pick-up your items. We accept payments to suit your requirements. BANK TRANSFER or BANK DEPOSIT. Online or over your Bank's counter. We're a shop/warehouse at. By consolidating your parts into the one parcel. We can only do this before you pay for the items. Most parts are sent by Australia Post'eParcel' with tracking and larger parts by door-to-door courier. Parts that can't be sent by Australia Post will be sent by door-to-door Courier and details will be emailed to you for this process. We offer good old fashioned, common sense warranties. We may need proof (pics etc) so we can claim against the carrier. The item "Holden Bailey Door Belt Weather Seal Strip FRONT Kit HJ HX HZ WB belt rubber" is in sale since Saturday, February 2, 2013. This item is in the category "Vehicle Parts & Accessories\Car, Truck Parts\Other". The seller is "restocountry" and is located in Melbourne. This item can be shipped to Australia, all countries in Europe, United States, Japan, Canada, Hong Kong, New Zealand.